The detergents and other washing and cleaning agents we use at home contain a lot of chemical components. While they’re good at killing germs, they’re not so good for our skin… or the environment for that matter. What if you could keep your home squeaky clean without the use of chemicals? FeedFond has researched and put together these 10 chemical-free cleaning ways that leave your home both clean and healthy. #9 Foul smells from the fridge. #5 Shower tiles and door. #1 Ceramic tiles in the bathroom. Sometimes the rust in the shower heads can affect the flow of the water. 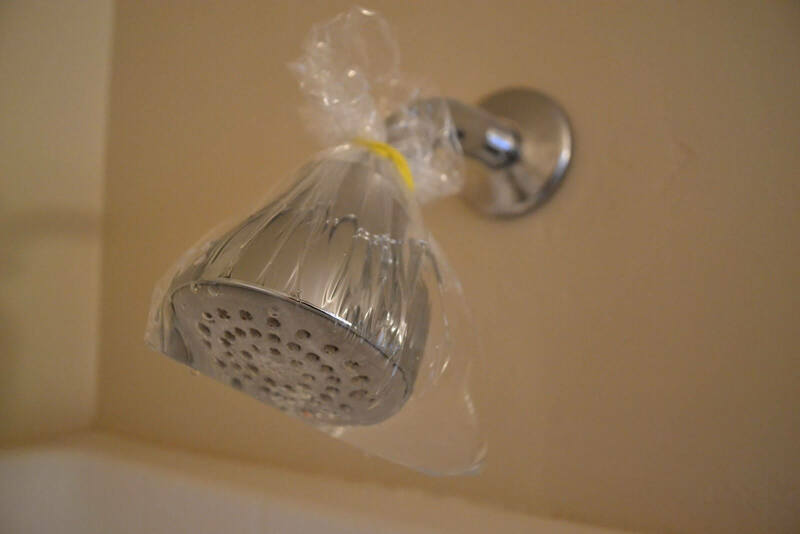 to clean the shower head, put some vinegar into a polythene bag and tie over the shower head with the help of rubber bands. Leave overnight to wake up to a perfectly clean and well-functioning shower head. Wear a sock in your hand and dip it in a solution of one-part water and one part vinegar. Now wipe the dust and stains off the blinds. Pour in a spoonful of lemon juice and water and boil for five minutes. Throw the water away to discover a brand-new kettle. To remove burnt food from a frying pan, cover the surface with water and add a glass of vinegar. On a medium heat, bring the solution to boil. Remove from the flame and add two tablespoons of baking soda to loosen up the burnt food. To have a bacteria-free mattress, mix 3 parts of water to one part of vodka. Spray the solution for disinfecting your mattress and to kill most bacteria. To do away with the old look of your oven, make a paste with half a cup of water and 1 cup of baking soda. Apply this paste on the inside of your oven and wait for 15 minutes. Then wash away the surfaces with water and use a clean and soft cloth for drying the glass. Take a spray bottle and fill it with white distilled vinegar. Spray on the grimy areas and wipe with a clean dry cloth after 15 minutes. Get rid of foul smells by cleaning your fridge with a solution containing equal parts of water and lemon juice. This will get rid of the smells from inside your fridge. You can also add some baking soda for better cleaning. To thoroughly clean your wooden chopping board, use half a lemon to scrub the surface and then sprinkle some coarse salt. Wait for 5 to 10 minutes before you use the other lemon half to scrub again. Finish off by rinsing with warm water. To make sure there is no deposit in your washing machine, you should clean its inside regularly. Use 80g of citric acid in an empty washing machine and set the power on the hottest wash cycle. Watch your washing machine clean itself. Use one part of ammonia with ten parts of water to clean your windows. Grab a microfiber cloth or paper towel to wipe the windows dry. You can also use half a raw potato to clean your glass windows. Follow with a rub using a clean cloth. These are difficult to reach areas but can be efficiently cleaned using a toothbrush and some baking soda. Just dip a wet toothbrush in baking soda and say goodbye to those water stains and mildew. Rinse with water thoroughly. Use lemon to wipe these surfaces once a week and watch them gleam after you rinse with water. Get rid of unpleasant odors and stains on your carpet by sprinkling the surface with cornstarch and baking soda. Leave for 15 fifteen minutes before you run your vacuum over it. You can have the shine back on your mirrors by using a solution containing 1-part ammonia to 10 parts water and 2 tablespoons of alcohol. To clean hardwood floors, use one-fourth cup of vinegar mixed with a liter of water. For tiled floors, use boiling water to clean. If you have ceramic tiles in your bathroom, add vinegar and baking soda and leave on the stained areas for a few minutes. Then rinse with water and wipe dry with a cloth. Care to share any chemical-free cleaning hacks with us? Feel free to use the Comments section below.